Students will learn fundamental techniques with hand building and throwing basic forms on the potter's wheel. Youth will be challenged to create dynamic surface decorations using glazes, slips and applied elements. See our Kids Summer Camp Page for more Kid's with Clay! This class is designed to let parents and children work together to create a one of kind works of art. This special experience is a memory in the making while creating a keepsake to be enjoyed for years to come. See our Kid's Summer Camp page for Parent and Child class this summer too! This class is perfect for those kids who want to make wonderful holiday gifts for family and loved ones. 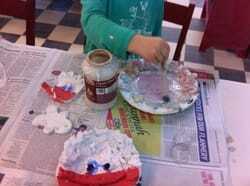 Your little artist will make functional holiday themed pottery that will be treasure for years to come. In this three session class students will make with clay the first class, personalize their creations by painting, and glaze their creations in the final step to making their art work functional. Projects will be fired and ready for pick up just in time for Christmas! In this three session clay class young students will create one of a kind Christmas ornaments documenting the year and age of your child. Their precious creations will be treasured keepsakes that will be enjoyed for years to come and make great gifts or present tags. Make this holiday special and one of a kind by making handmade holiday treasures with your loved one. Create gifts to give or spread holiday cheer with special inspired decorations for the home. In this three week holiday clay class young students will create unique Menorahs for your Hanukkah celebrations. These handmade keepsakes can be used and enjoyed for years to come.